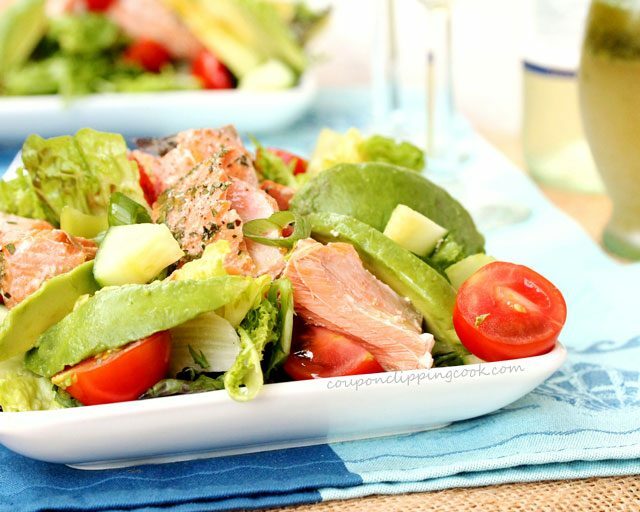 This moist and tender salmon on a fresh crisp salad with avocado will have you coming back for more. 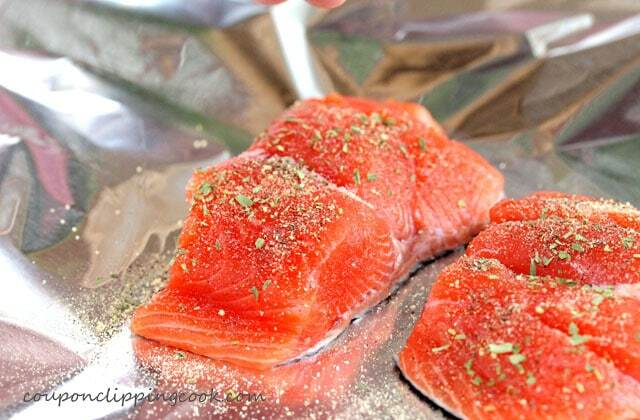 Fresh salmon is so delicious that when it comes to seasoning it, less can be more. 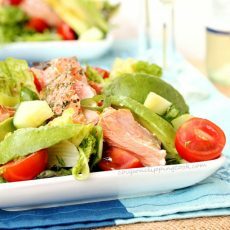 The salmon in this salad is baked in the oven in a foil “tent” or packet where the salmon cooks in its own steamy juices and comes out super moist and tender. It’s seasoned with a little tarragon (fresh or dried), granulated garlic, salt and pepper. The salmon only takes about 15 minutes to cook (more or less depending on the serving size) and its served slightly warm on a bed of mixed greens with tomatoes, celery, onion, cucumber and good sized pieces of avocado. The salad tastes really good with this homemade salad dressing “Tarragon and Balsamic Salad Dressing” or serve with your favorite salad dressing. 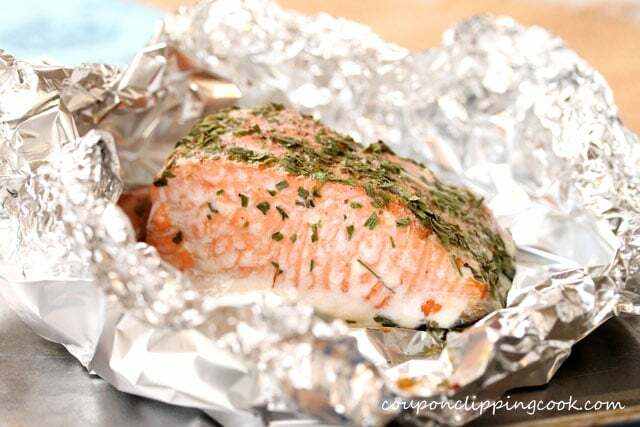 Set a large piece of foil on a small cooking tray or cookie sheet. 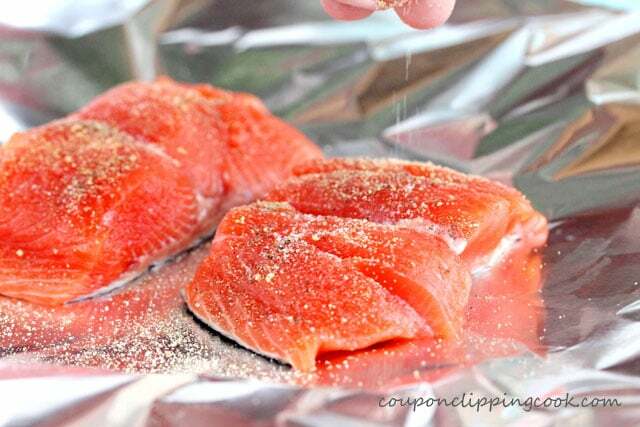 Be sure the foil is big enough to make a tent around both pieces of salmon. and tarragon on top of the salmon. 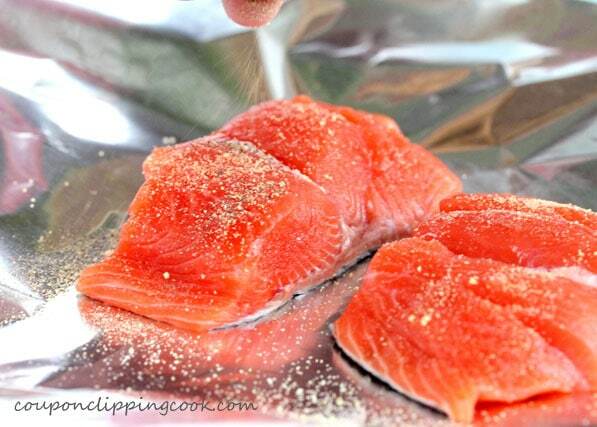 Make a tent with the foil over the salmon and seal the edges of the foil tightly. 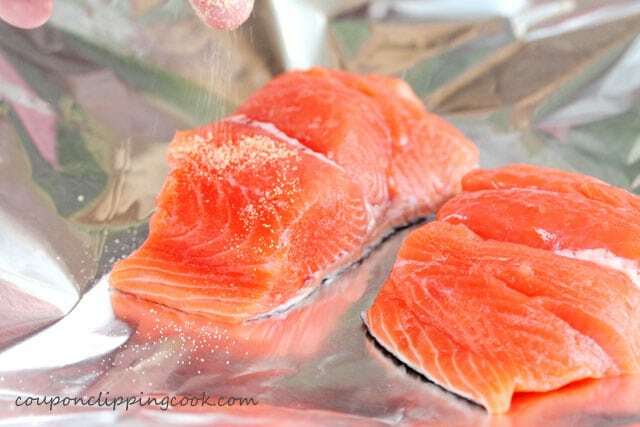 …bake the salmon for about 15 minutes or until it’s cooked through. 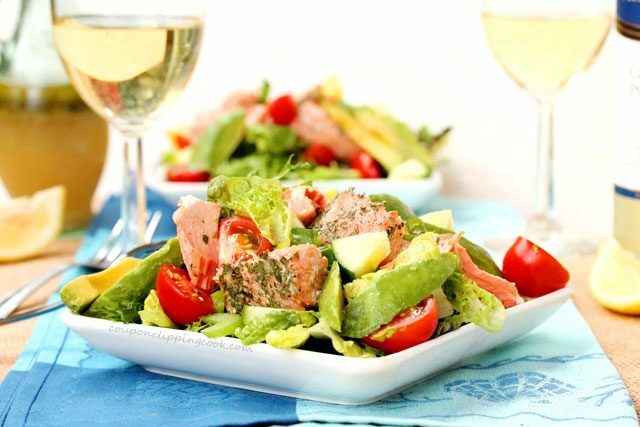 Serve the salmon while its slightly warm, on top of the avocado salad. 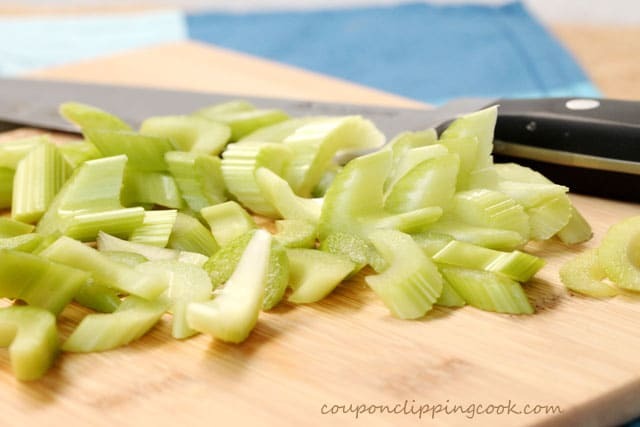 Cut the celery diagonally in about ½ inch wide pieces…. 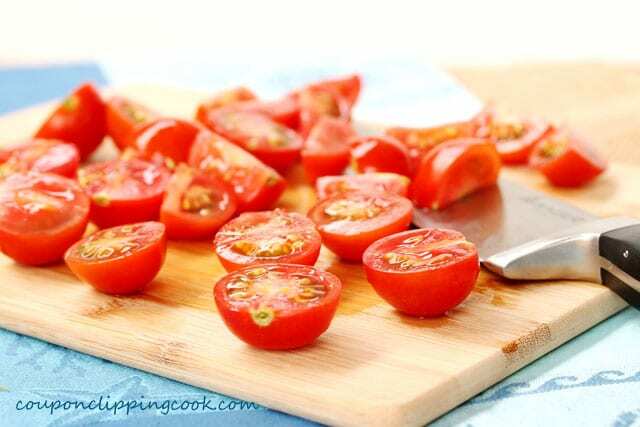 …cut the cherry tomatoes in half…..and some in quarters if you’re up for it. 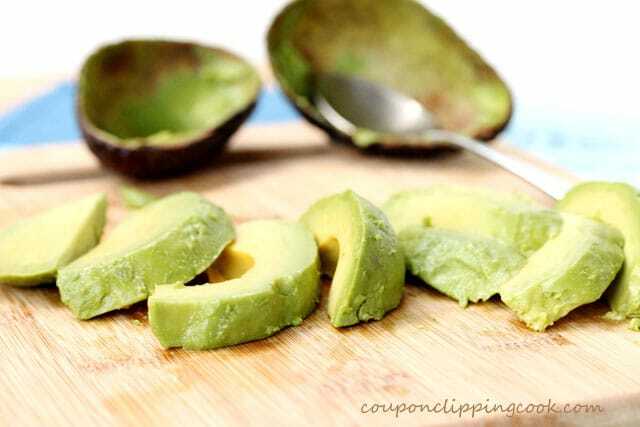 Then, slice the avocado into about 1 inch thick slices. Set aside along with the veggies and tomatoes for a quick moment. On a platter or individual serving plates, add a layer of the mixed greens. Top with celery, cucumbers, tomatoes, avocado and onion. 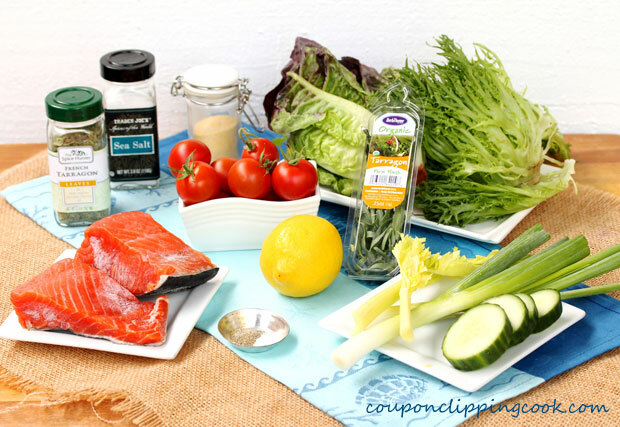 Gently break off large pieces of the slightly warm salmon and lay them on top of the salad. 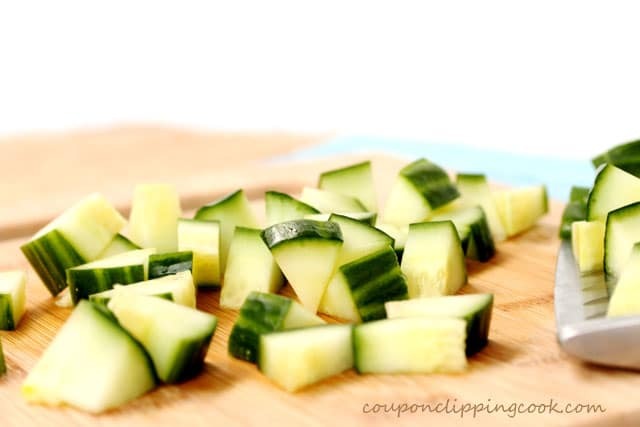 Squeeze lemon juice over all ingredients in the salad. Drizzle tarragon balsamic salad dressing (or your favorite salad dressing) on top of the salad. Serve by itself or with garlic bread. 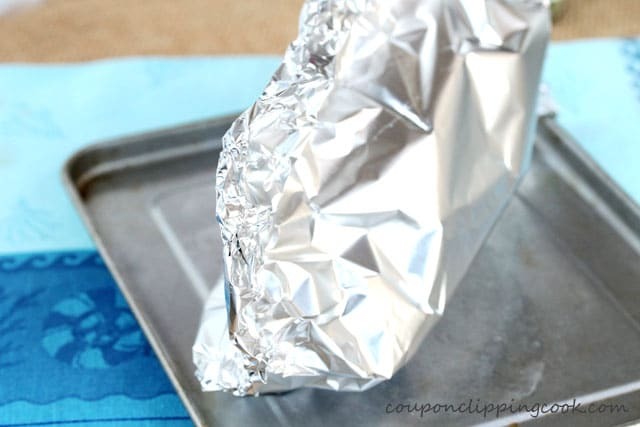 Set a large piece of foil on a small cooking tray or cookie sheet. 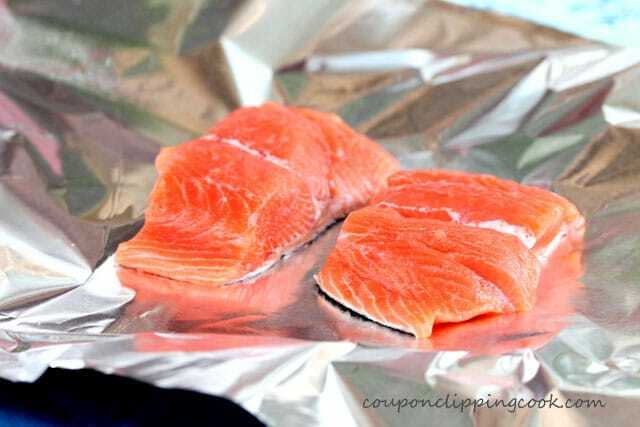 Be sure the foil is big enough to make a "tent" or packet around both pieces of salmon. Lay each piece of salmon on the foil, skin side down and sprinkle granulated garlic, pepper, salt, and tarragon on top of the salmon. Bake in a preheated oven for about 15 minutes or until it’s fully cooked (depending on the serving size, it could take less or more time to cook through). 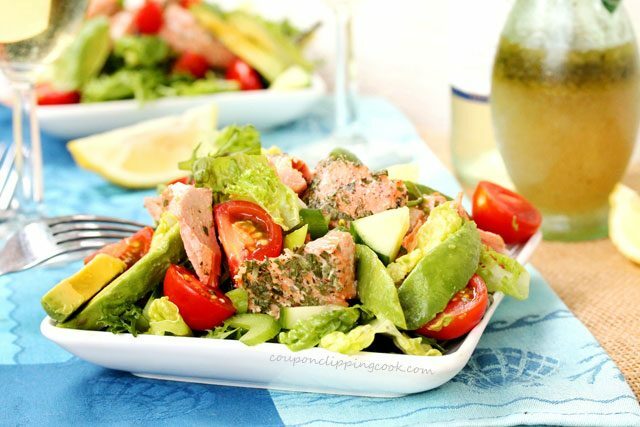 Serve this salmon while its slightly warm on top of the avocado salad. On a large serving platter or serving plates, add a layer of mixed greens. 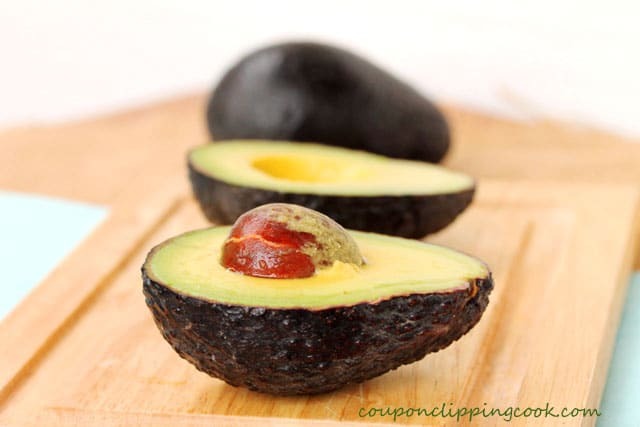 Top with celery, cucumbers, tomatoes, avocado and onion. 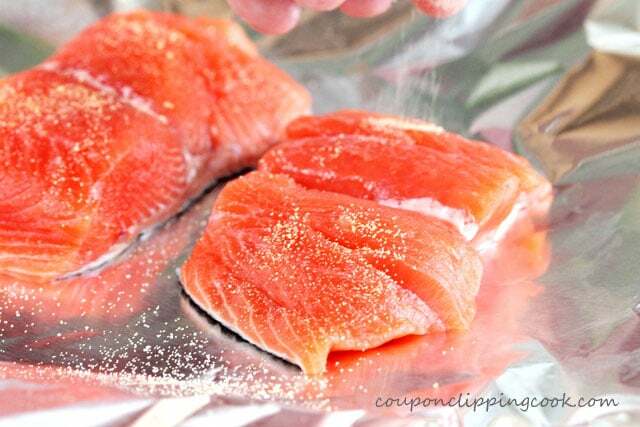 Gently break off large pieces of the slightly warm salmon and lay them on top of the salad. 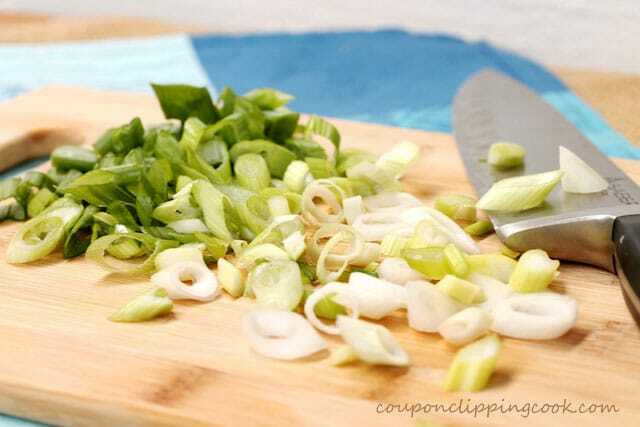 Squeeze lemon juice over all ingredients in the salad. Drizzle tarragon balsamic salad dressing (or your favorite salad dressing) on top of the salad. 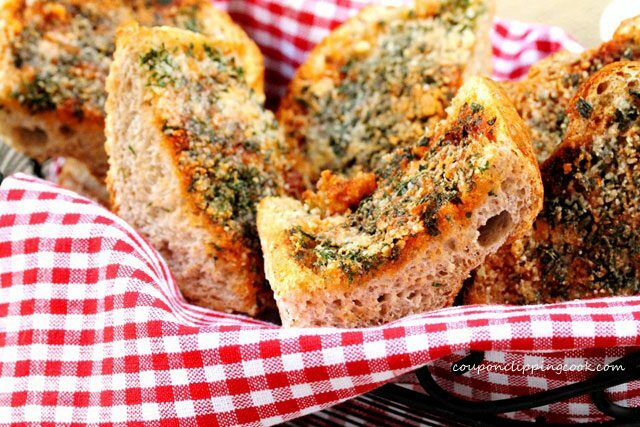 Serve by itself or with garlic bread. I love your technique for “tenting” the foil over the salmon. Seems like it would give it a lot of great flavor. As a wine connoisseur, I couldn’t help but notice that this salad would be great with a well-balanced Reisling. Hi There, thank you very much, and your wine suggestion sounds great! I’m a sucker for a good deal in the grocery store – I’ll have to remember your strategy of asking employees if they bought any!! Hi Laura, oh good, I hope it helps! Thank you so much for stopping by and have a great week!